Unsatisfactory voice rehabilitation results may occur due to one or more problems on several different levels (i.e., oral structures, PE segment, voice prosthesis, tracheostoma, and trachea). Furthermore, the patient may have problems with respiration or posture. 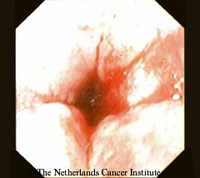 Two other specific kinds of problems are combined or intermittent use of esophageal along with TE speech, and voice problems during radiotherapy. 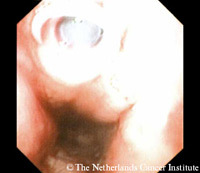 With respect to the latter problem, an example is shown to the left: the top figure shows an endoscopic view of the PE segment and the next figure the view at the level of the voice prosthesis in a patient, who needed a gastroscopy in the 5th week of his radiotherapy. As can be seen, there is no problem at the level of the voice prosthesis, but there is distinct redness and edema in the PE segment it self, which explains why the voice often deteriorates during radiation. However, it is important to encourage the patient to continue to use the prosthetic voice and to reassure him/her that the voice most likely will regain its original quality soon after completion of the radiation. If occlusion of the stoma during radiation is a problem due to skin irritation and soreness and the HME adhesive can not be used, the use of a Larytube cannula can solve this problem, enabling prosthetic voicing. In case of doubt about the cause of a problem the use of diagnostic videofluoroscopy of speech and swallowing is an excellent tool for visualization of the anatomy and function of the PE segment (McIvor et al., 1990; Van As et al 2001). Table 1 presents an overview of the different problems, the levels/areas at which they exist, and possible solutions for resolution. Table 1. 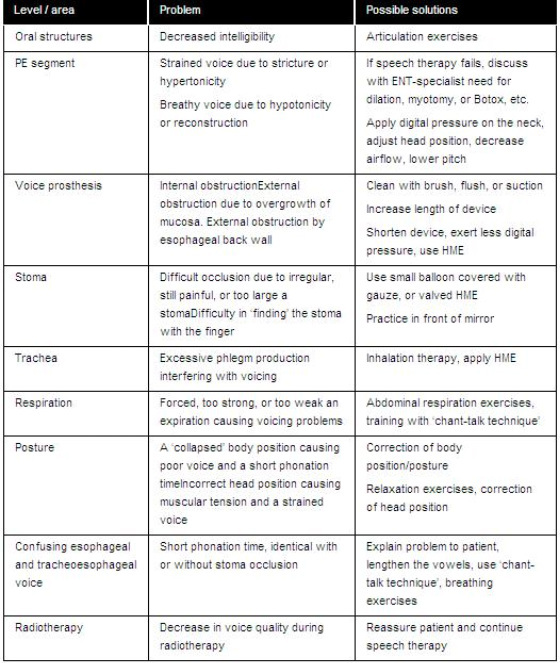 Overview of different problems encountered in surgical prosthetic voice and speech rehabilitation, the levels/areas at which they exist, and possible solutions. A special point of interest is the combination of a trachea cannula like Larytube with the use of a voice prosthesis in patients with a narrow stoma. Often patients can voice without any problem with this cannula in situ, because the narrow stoma often makes airtight occlusion easy, whereas there is sufficient air passage along the cannula towards the voice prosthesis to enable comfortable voicing. If, however, not sufficient air is directed towards the voice prosthesis, it is advisable to use a fenestrated version of the cannula. If the standard fenestrations are not ideally situated in front of the prosthesis, these can be custom made in a non-fenestrated cannula with a simple punch (which is available with the Larytube system). It is not advisable to make one large hole in the cannula, because this might get trapped behind the tracheal flange of the voice prosthesis during removal of the cannula with obvious problematic consequences.